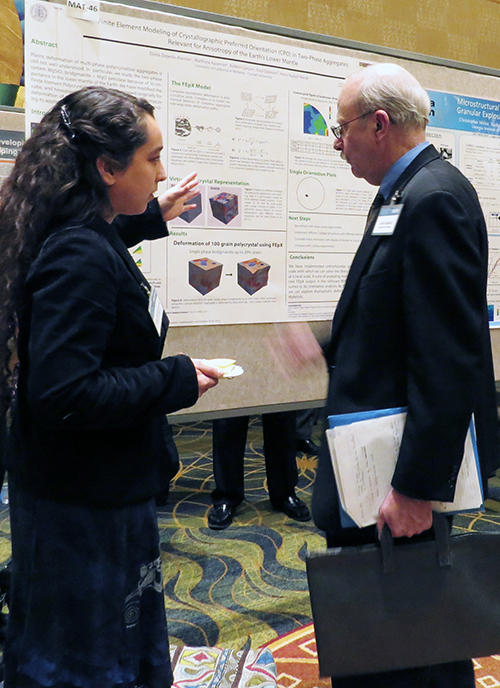 CDAC Student Eloisa Zepeda-Alarcon (Berkeley) won a Best Poster Award at the 2016 Stewardship Sciences Academic Program (SSAP) 2016 Symposium for her poster titled "Finite element modeling of crystallographic preferred orientation in two phase aggregates: relevant to anisotropy in the Earth's lower mantle." 140 student posters were presented and eight Best Poster Awards were given. This is the third year in a row that Eloisa has garnered a Best Poster Award. In addition, she won the Outstanding Graduate Student Instructor Award from the Department of Earth and Planetary Science at Berkeley.